Another cyclops to answer the cri de coeur from Gothridge Manor for more monocular monsters, this one with a seasonal twist (a mummified cyclops) and as it's harvest time, I figure a cyclops crusher with locusts, beetles and other crop eaters would be suitably scary. A greedy cyclops who crushed those who defied him in the name of his fomorian masters, he would stalk the fields of the terrified subjects and crush them flat under his tread. Yet the fey can be vengeful; they got Unasha-ti drunk on potent wine and restrained him with ropes as he slept. When he awoke, things got inventive. The greedy hunger of Unasha-ti was known well to the villagers so they mocked him as they filled his maw with beetles and grubs, choking him on a wave of crawling, scuttling things. Then they raised him up on a pole as a warning to the fomorians he served. Three nights later, the moon turned black as sackcloth and there was a faint red fire around the rim. To their horror, the fey saw Unasha-ti break free from his bonds, crawling with locusts and beetles, leaving grubs in his wake as he crushed the fields under his tread. The eladrin drove him off with burning magic but Unasha-ti wrought it's revenge as the fields burned around his long strides, fleeing into the woods and hiding. 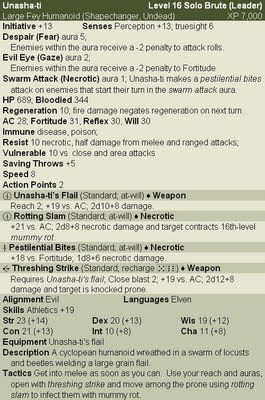 The gods heard Unasha-ti's choked cries of suffering and deemed the punishment unjust; they unleashed him in his new state upon the fey who now seek heroes brave and powerful enough to strike down a terror of their own making. Yet Unasha-ti has turned spiteful in undeath and thinks nothing of stripping the flesh from the helpless as he walks, wreathed in locusts, beetles and biting flies.